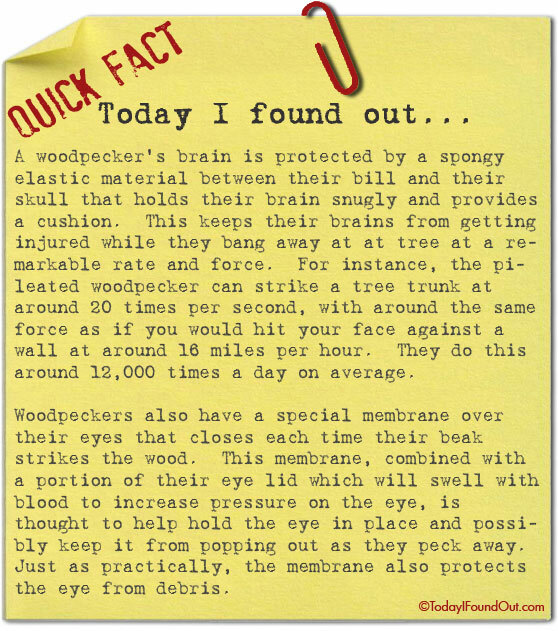 A woodpecker’s brain is protected by a spongy elastic material between their bill and their skull that holds their brain snugly and provides a cushion. This keeps their brains from getting injured while they bang away at at tree at a remarkable rate and force. For instance, the pileated woodpecker can strike a tree trunk at around 20 times per second, with around the same force as if you would hit your face against a wall at around 16 miles per hour. They do this around 12,000 times a day on average. Woodpeckers also have a special membrane over their eyes that closes each time their beak strikes the wood. This membrane, combined with a portion of their eye lid which will swell with blood to increase pressure on the eye, is thought to help hold the eye in place and possibly keep it from popping out as they peck away. Just as practically, the membrane also protects the eye from debris. Its show that woodpeckers could their elementary physics theory about the conservation of the momentum before human beings.